To be fair, this all hasn’t happened since the last post. I took that picture a couple of days before I wrote the blog entry. This is another panel from TNCM, Plate 32:1. It’s a long repeat with two reflection points. This scrap is the center of one of them. As you can see the pattern will mirror image left and right along the centermost line of the stem interlace. There’s another totally different bounce line that will just make it onto this cloth, but the repeat on the other side of it won’t be full cycle. I really like these extra long repeats, but they’re hard to use for most modern work unless one is doing a whole length of bed linen, or wishes to stitch at gauges much smaller than most modern embroiderers attempt. The longitudinal repeat for this pattern for example is 257 units. On 14 count Aida for example, 257 stitches works out to a strip that’s 18 inches long, and that’s just for one repeat. I’m not much better here, stitching as I am on quite coarse 36 count linen. 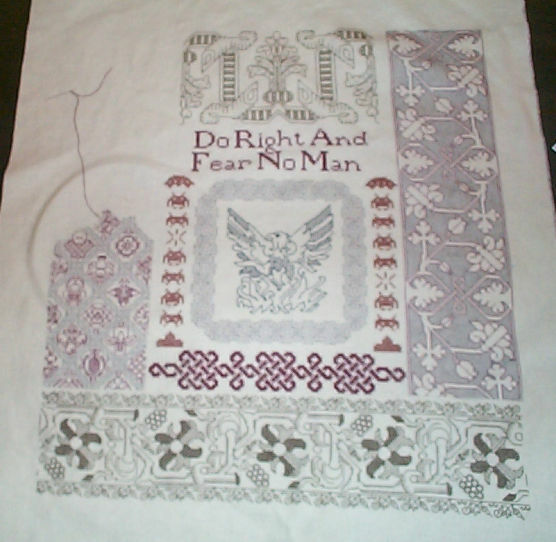 My repeat will be about 14 inches across, just a little bit narrower than the width of my stitched area. For the record though, this isn’t the longest repeat I’ve got in TNCM. That one is 308 units, and is the one I want to use on my notional library curtains. Someday. 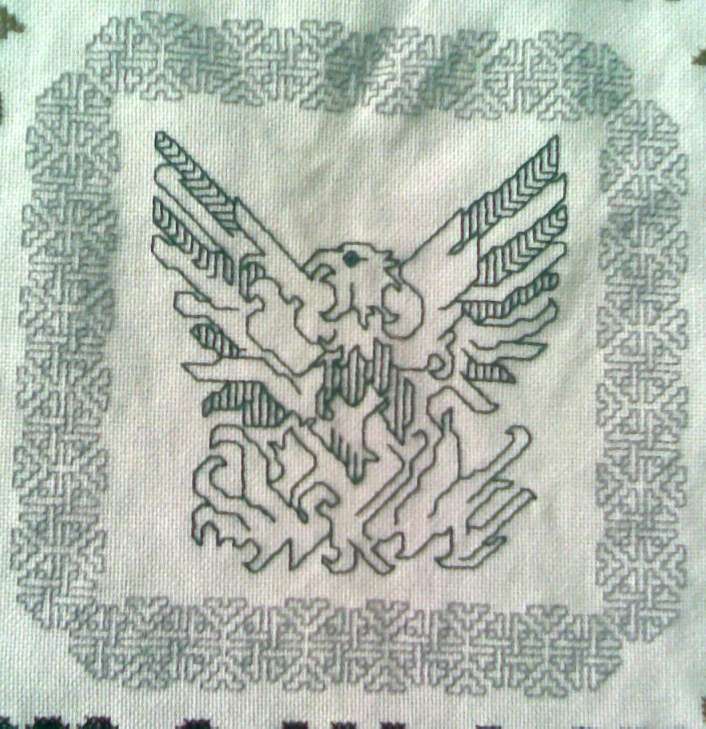 In other embroidery related news, I had forgotten that I had given my pals at the Buttery permission to post my original line unit pattern named after their house. Please respect my copyright though and don’t repost the page. Also the pattern in TNCM and available at the Buttery link above shows only a bit more than half of the fillings I worked in the swatch above. The new ones I doodled up specifically for the Do Right sampler. Very simple completion here: a simple full back with a deep rod pocket at the top, and a hanging stick made from a dowel and two wooden beads. And as hinted at before – the wide green band at the top (the same heavy twill weave cotton that makes up the backing) balances out the wider strip of green embroidery at the bottom. It works. Or so I think. Oh. The sage green fabric? It’s a remnant. Long time readers here have seen it before. The color in the earlier pix is truer to the real thing. There’s no such thing as extra fabric or yarn, it’s all just fodder for future projects. Elder Daughter takes Do Right back to the dorm in the morning. 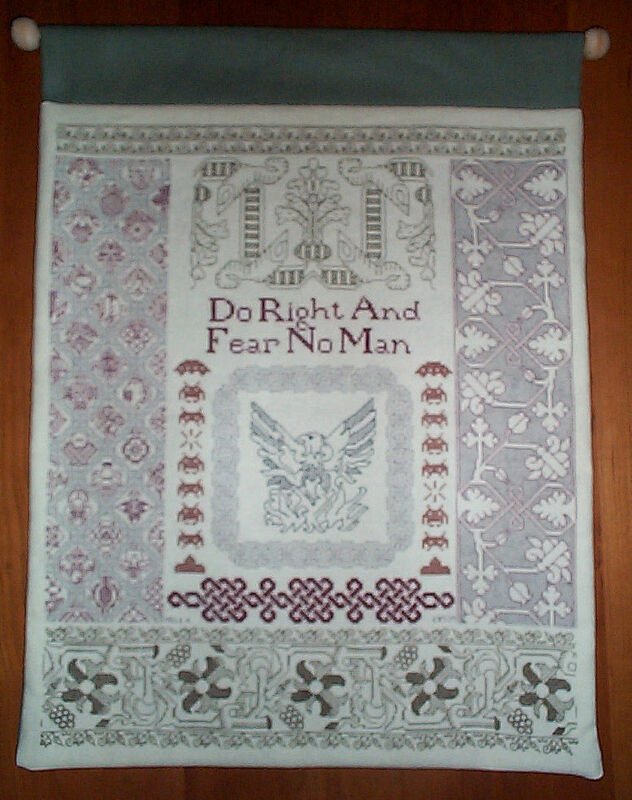 The stitching on my Do-Right sampler is finished! Now it’s just a matter of finishing the thing out for display. Probably by backing it with fabric, and inserting a rod and hanging string at the top. For the record, the stitched area is approximately 14.5 x 18 inches, worked at the relatively large and quick to stitch gauge of 15 stitches per inch on 30 count linen. Back when my eyes worked better, I preferred stitching at 25 spi, but so it goes… With luck and deadlines willing, the whole thing should be totally complete and wall-ready in time for Elder Daughter to bring it back to school with her after Thanksgiving break, where it will adorn her wall, admonish her to greater excellence, and annoy the heck out of her roommate, all at the same time. Knitting visitors here will be disappointed to hear that the itch to stitch has not yet left me, and I’ll be working more of it before heading back to knitting or crochet. 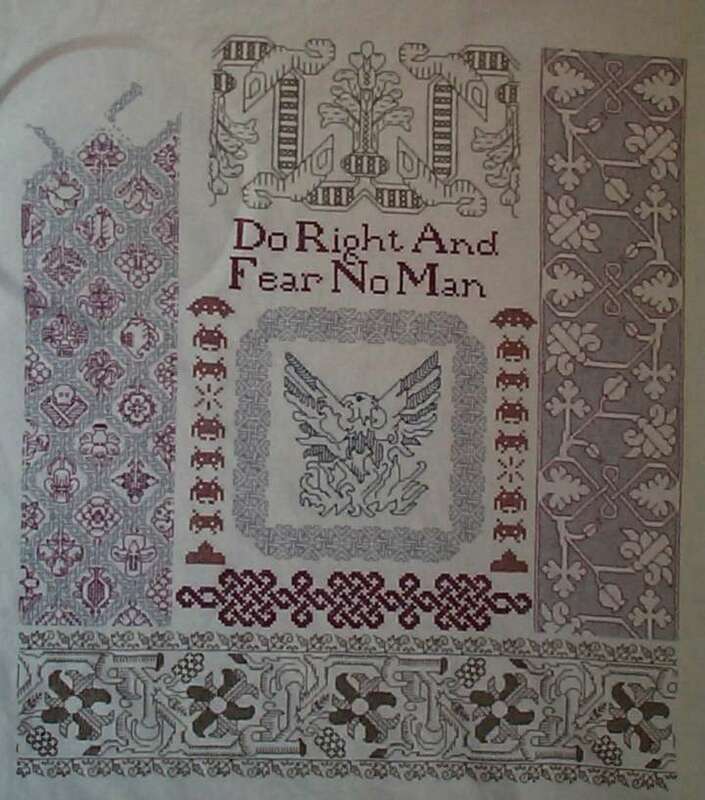 I am contemplating another accreted sampler of this type, this one for me. I’m not sure what to say on the new project yet, although I’m leaning heavily towards Clarke’s third law or Elbert (Roycroft) Hubbard’s “An idea that is not dangerous is unworthy to be called an idea at all,” but I will entertain suggestions of other similarly incongruous yet pithy non-sectarian sentiments. Feel free to post them as comments here. To head off one potential suggestion, I’ve already done one for The Resident Male that features “Do not meddle in the affairs of wizards, for they are subtle and quick to anger.” Eventually I’ll get around to sharing pix of that one here. 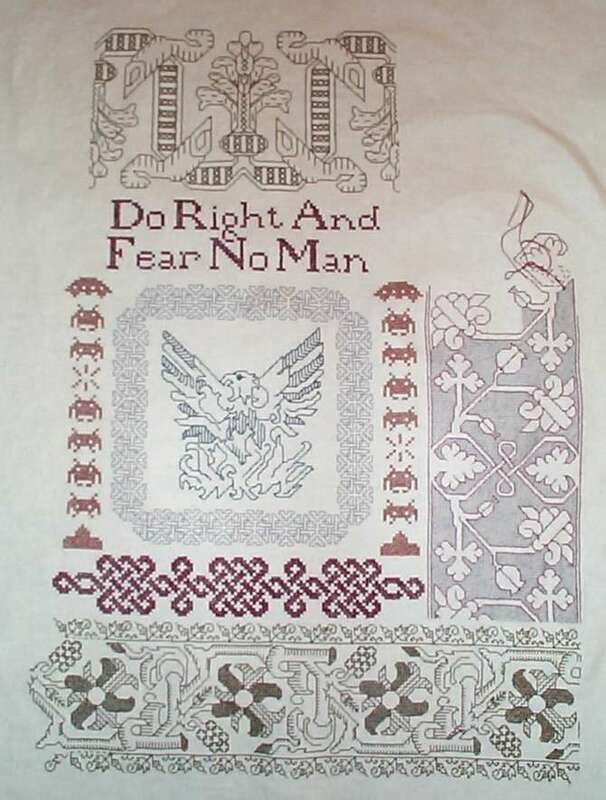 It’s a long band sampler, done in deep red on cream linen. I doubt that 10% of the people visiting his office have read the saying. And I’m not sure what the next one will look like. Lots depends on the length of the statement. I’m leaning towards monochrome again, possibly plain black, possibly a single color – deep green or navy blue on off-white linen, but no decisions have been made. I’m also thinking of playing with some of the antique graphed alphabets from Sajou and other European vintage stitching magazines, many of which are available here. Very slow progress on Do Right. A bison-stampede of work related obligations has me tooling flat out, days, evenings, nights and weekends. But here and there I grab a bit of stress abatement, and stitch. I think Elder Daughter will be especially pleased by that one truly incongruous motif. This strip will continue straight up to the top of the currently stitched area, which means **LOTS** more flower/fruit fills. My only moment of pause right now is that I’m thinking of picking out the acorn spot in the current strip. When I first drafted it up I committed an awkwardness. The vertical acorn has no point on it. It annoys me, and I may restitch that unit one block down and make some other adjustments so that the up-down acorn is outfitted the same as its brothers. Aside: For those who enjoy historical patterns, check out this collection of vintage European embroidery guides. Most are graphed alphabet collections, but there are some other gems in and among the lettering – even some charts suitable for double running stitch. I’m considering a couple of the latter for my final lacy feel narrow strip across the top of this piece. And the alphabets are great. I’m thinking of doing up an entire cloth of different forms of just one letter, as the ultimate initial-laden gift sampler. I’ve finished the right hand strip on my Do-Right sampler, plotted a strip of equivalent width on the right side, and settled on a pattern. 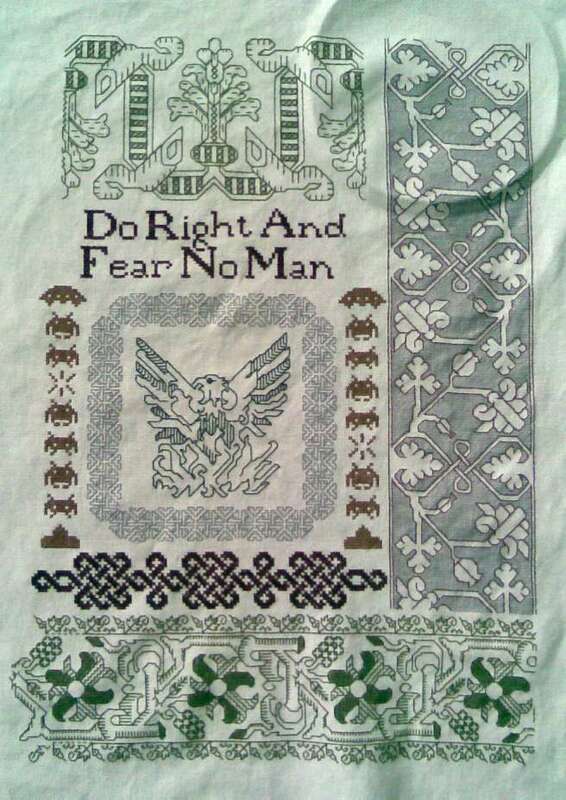 I’m using another from TNCM – the Buttery pattern (Plate 59:1). This one is original, inspired in equal parts by historical motifs, a happy communal house where many friends have lived over the years, and boredom. The historical part is the twisted framing mechanism, with each diamond shape hole holding a different flower or fruit motif. Many of the motifs are very traditional, too. 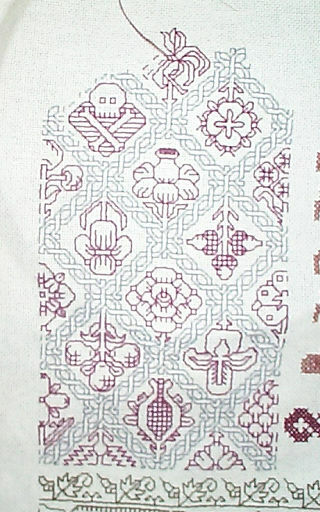 The completed pomegranate in the center of the worked strip, for example is a very common motif, and in execution would be easily accepted as an authentic motif. What’s not historical is that there are no exact sources for anything in the Buttery design, not even the exact structure of my twist frame, or that pomegranate. There are historical pieces that are close, but nothing is spot on (the large number of different fills in a counted piece is for example, something for which I’ve never found precedent). But the overall effect isn’t wildly out of phase with expected period aesthetics. I wouldn’t advocate using it on a historical re-creation, but for someone with the freedom to play in the style without accountability to authenticity hawks – why not? 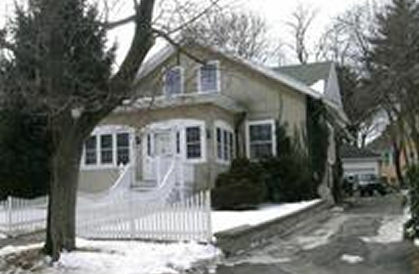 The Buttery part is the home of many friends over the years. Presided over by Marion and Mark, it’s been the base of an ever changing constellation of people, each very different yet all living in harmony. Sort of like the collection of motifs in this piece – each unique, but each complementing the rest and contributing to the whole. 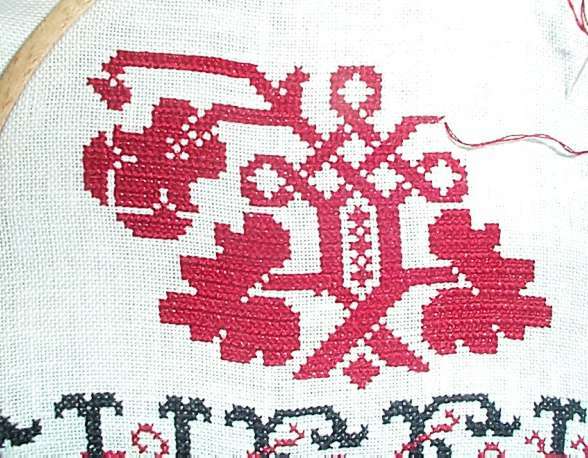 And for boredom, this is a function of having done lots of stitch by stitch repros of historical patterns. No matter how long the repeat, eventually “Are we there yet?” syndrome sets in. This piece was a think-exercise, to see how many different individual and distinct fruit or flower motifs I could come up with, given the established space constraint of the frame. 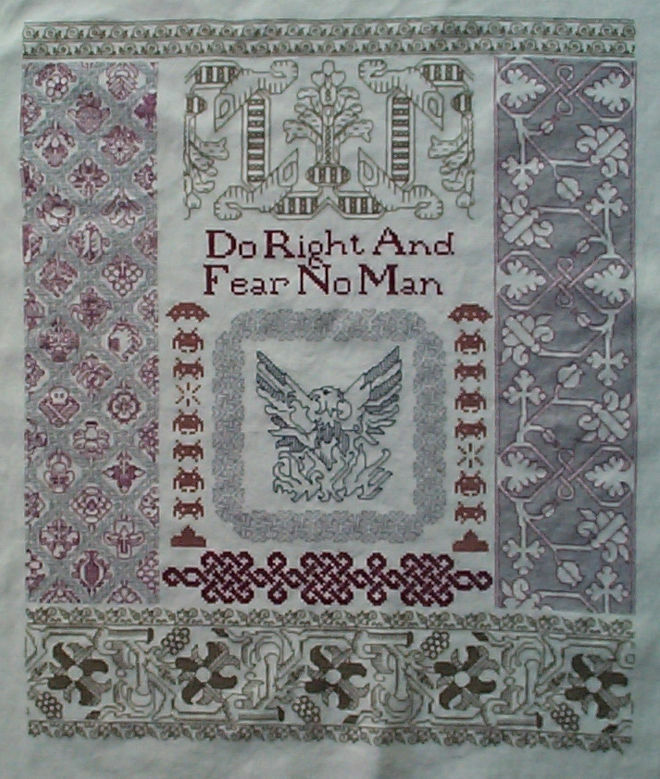 The version published in TNCM has 18 different motifs. I’ve got a few more that didn’t make it onto that page. Maybe I’ll use them on this strip, or maybe I’ll doodle up some others. We’ll see as I begin to get to the point where I need to recycle previously stitched ones. For the record this is the third thing I’ve stitched using Buttery. One was a book cover in black silk on 40-count linen, edged with black silk cording. The entire surface of the book cover was done in this pattern. 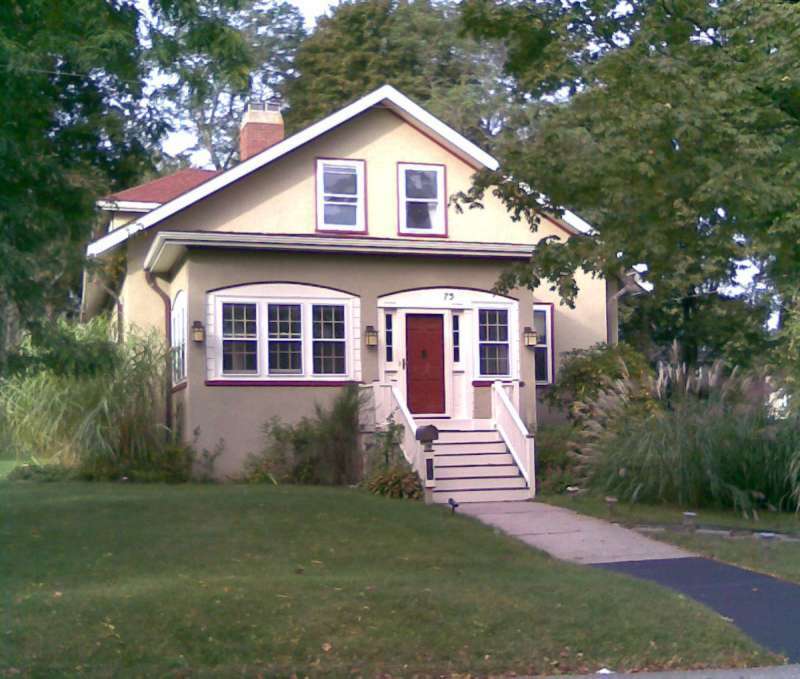 I worked it around 1994/1995, around the time we moved back to the Boston area. I gave away the book cover around a blank book, as the first prize in a storytelling competition, aptly won by Richard, who coincidentally happened to be an on-again/off-again Buttery resident. I also did a small sweet bag in this pattern (sort of an Elizabethan gift bag, just big enough to hold a handkerchief or small treat). In that case I did a strip of the framing with a selected subset of the fillings at the top and bottom of the bag, leaving the center area unworked. The sweet bag was monochrome brick red stitching on a cream linen background. I forget the count, but it was also relatively fine, small enough for five motifs to march across the thing, and the bag was less than a fist wide. The sweet bag was given away as a gift, long before I began photographing my work. 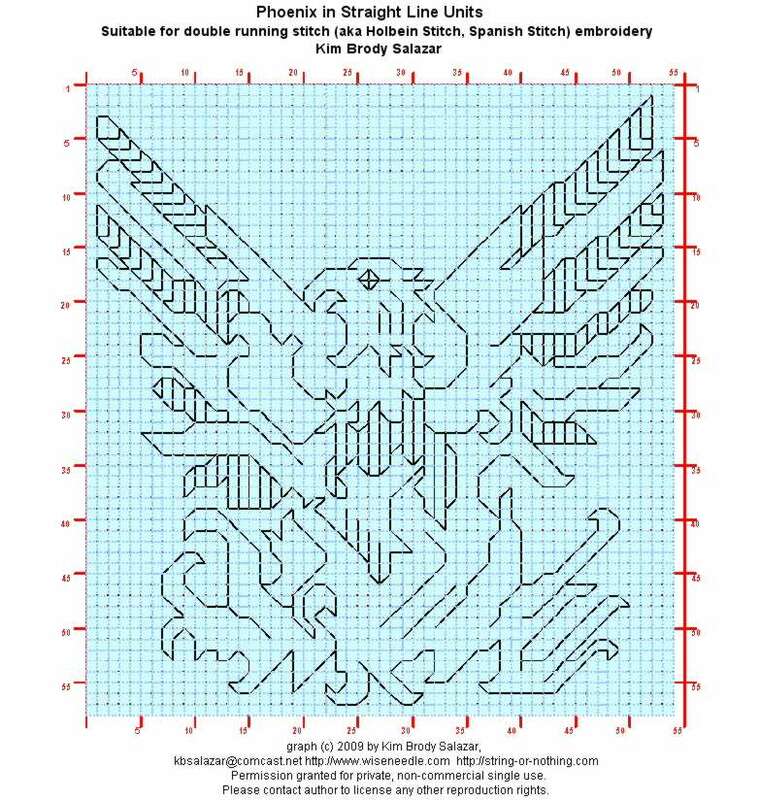 Yes, in addition to finishing up the phoenix graph I posted yesterday, I was able to make a bit of progress on the sampler over the weekend. Not much because work obligations intruded, but some. 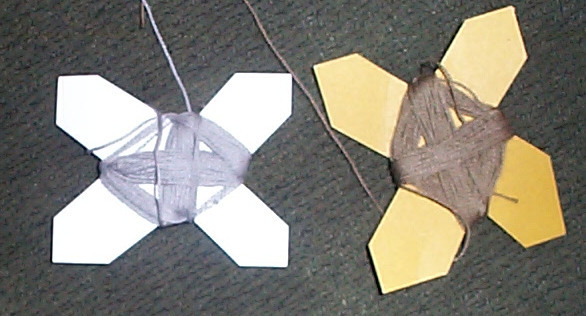 In this typically blurry String photo you see the center strip, with the handkerchief panel stretching across a wider area. I’ve started filling in another strip panel on the right. Since I’m winging this rather than planning it out fully prior to execution, I wanted to begin that panel so I would know how wide to make the bottom strip. There will be another two-tone panel of some type (pattern as yet unspecified) at the left hand edge. I’m going to try to make these both the height of the entire sampler, minus perhaps another as-yet unidentified narrow strip across the entire top. 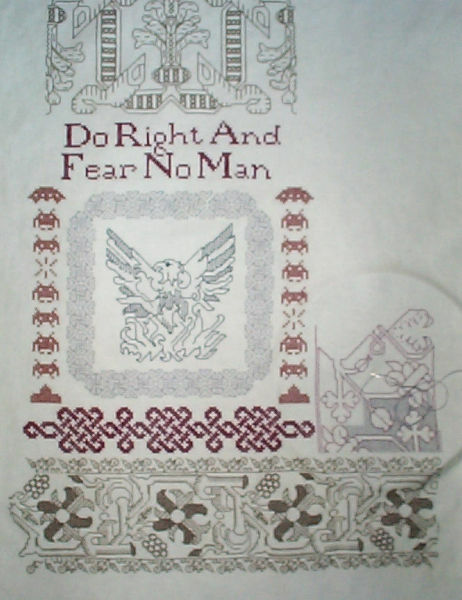 This new pattern, like the majority of the others is pictured in The New Carolingian Modelbook. This one is the other pattern on Plate 63 (63:1). The ribbon bit at the center top is on that same page. This one I graphed up from a photo of an artifact appearing in Lanto Synge’s Royal School of Needlework Book of Needlework and Embroidery. It’s a curious piece, stitched without background in blue silk. The curious part is the reverse gives clues that it might have been done in something like reverse chain stitch, with the chains on the back, showing a top appearance similar to double running. 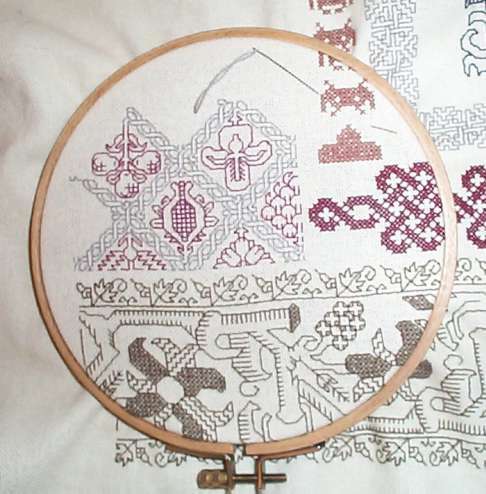 I’m working it in plain old double running, and have chosen to accent the pattern with a background of half-cross stitch. I’m working the background with verticals and horizontals on the reverse rather than reversibly as true double running because I’m short on the gray thread, and want to economize as much as possible. Better pix on this panel soon, I promise. 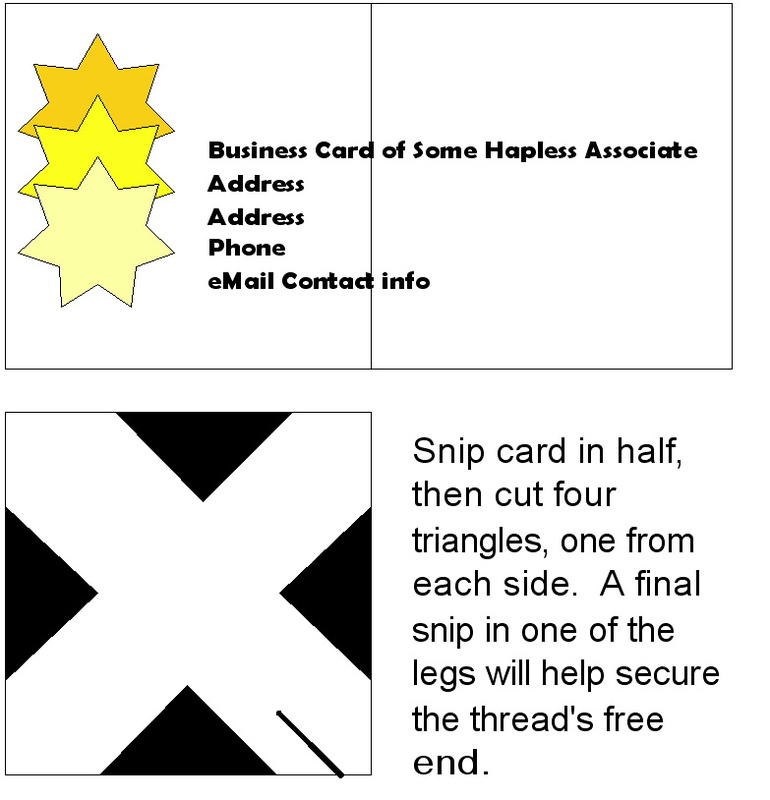 Click on the chart thumbnail to see a larger version. Apologies to those with slow connections – it’s big.